Westbound on Interstate 8. Courtesy of flikr / Luke Jones, 2011. 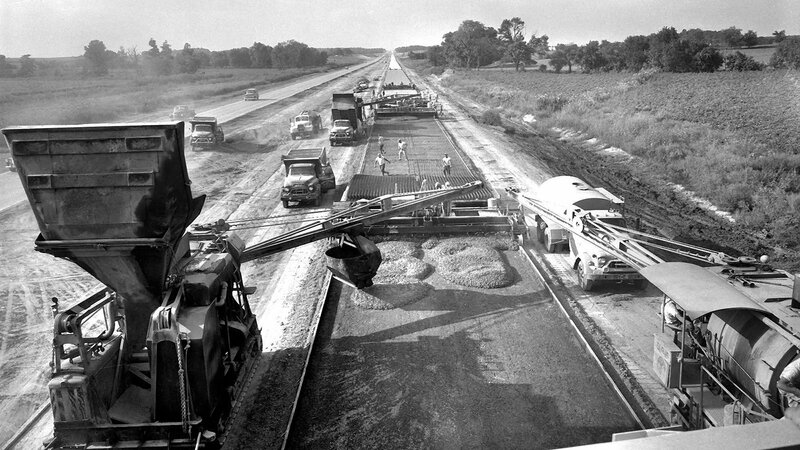 Plans for an interstate highway had been around since the Depression but finally came to fruition under President Eisenhower, who had seen the value of good roads as he led troops through Germany during WWII. This undertaking – the largest engineering project in human history – would also accelerate an exodus to suburbia. It had been proposed and debated for decades. 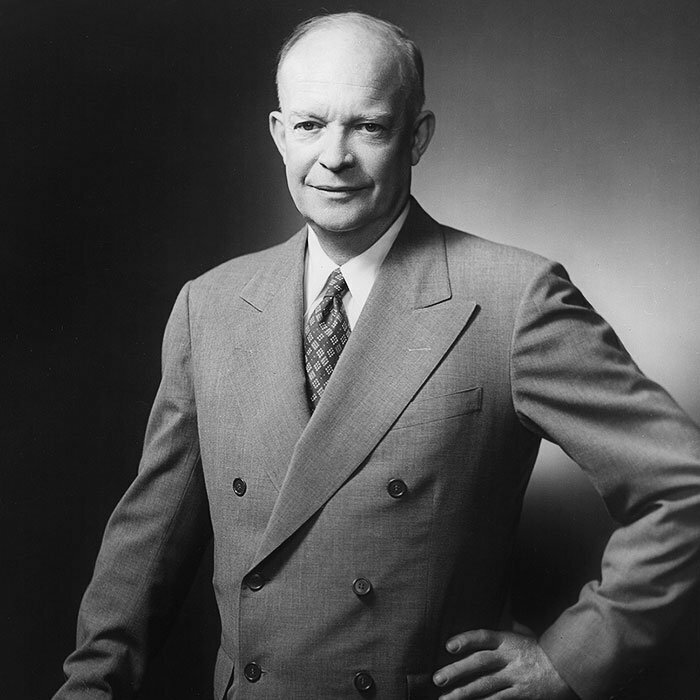 But ironically, it was President Dwight D. Eisenhower – a small-government Republican – who finally succeeded in launching the largest engineering and public works project in human history: the $129 billion Interstate Highway System. Eisenhower had seen the value of good roads firsthand as he led troops through Germany on the Autobahn during World War II. 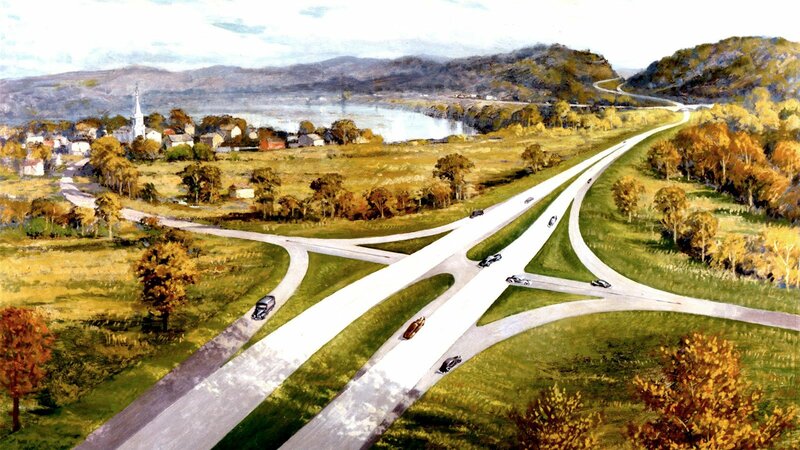 For decades, America’s highways had been a patchwork of mostly locally funded roads. In 1919, America’s first transcontinental military convoy set out on the Lincoln Highway to test the war-readiness of the country’s infrastructure, and it took a full two months for them to make it from the East Coast to the West Coast. Eisenhower, then a young lieutenant colonel, was part of that convoy and devoted an entire chapter to it in his memoir, At Ease: Stories I Tell to Friends. 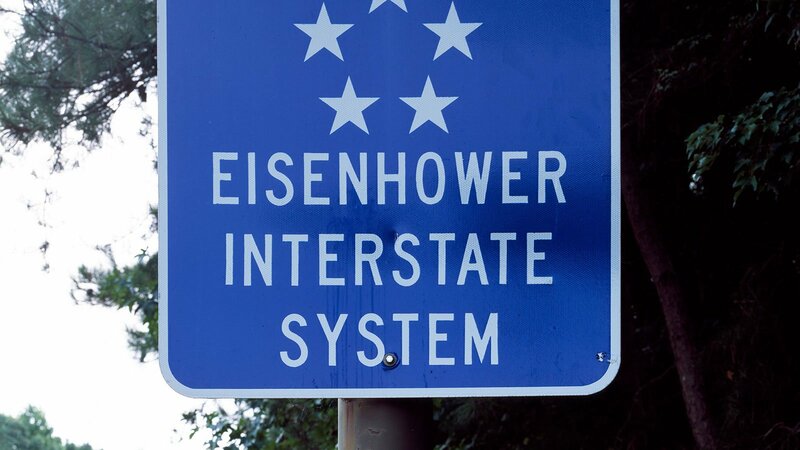 Eisenhower became commander-in-chief in 1953, and with Cold War tensions rising, he dedicated himself to developing the nation’s highway system, partly as a matter of national defense. In addition to wanting to move weapons and troops quickly if needed, he knew that the highways would be life-saving infrastructure in the event of an attack. “Eisenhower thought that rebuilding the cities, rescuing people, all of that hard work would happen along the interstate system,” said McNichol. He also believed that it would help cut gridlock, make driving safer, and jumpstart the nation’s economy. 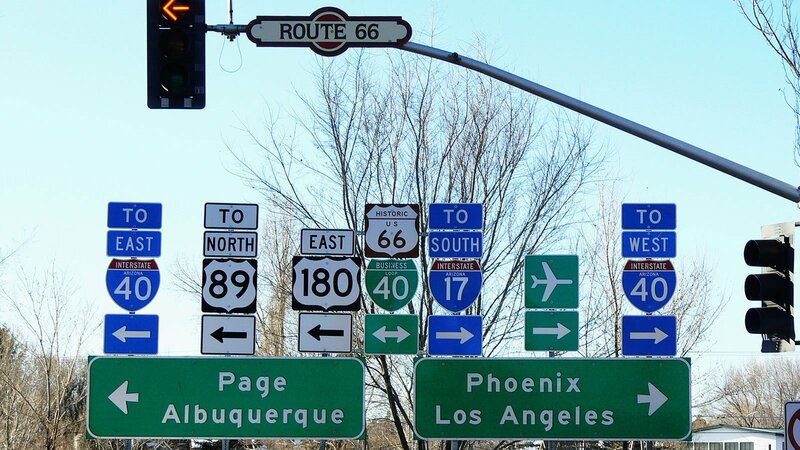 So when he finally was able to sign the Federal Aid Highway Act of 1956, creating the Highway Trust Fund and eventually the Interstate Highway System, he considered it his crowning achievement. In it, Congress mandated that revenues from the federal gasoline tax provide 90 percent of the cost of the construction for the system, with the states picking up the remaining 10 percent. 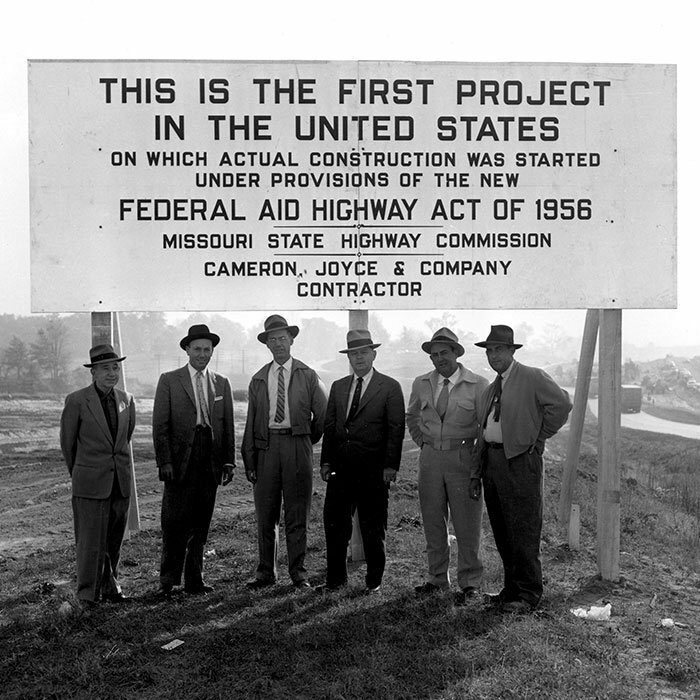 Just seven weeks later, workers broke ground on the first stretch of the highway in Missouri, on a section of what is now I-70. It was the first of many. From coast to coast, construction crews made way for 41,000 miles of new road. They used 2.3 billion tons of cement and crushed rock and strengthened it with millions of miles of steel reinforcement bars. They built 55,000 bridges and overpasses, more than 100 tunnels, and used more than a billion pounds of dynamite and other explosives. The sheer volume of work and number of people dedicated to the initiative led to major innovations in the construction industry. 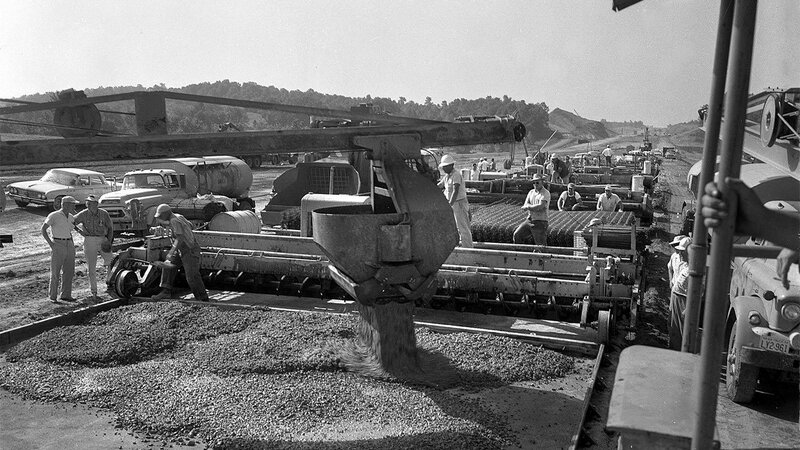 Before the interstate, road construction was typically done with farming equipment. But the size and scope of this project demanded bigger and better tools. Everything they built had to follow the strict geometric and construction standards set forth in the act. 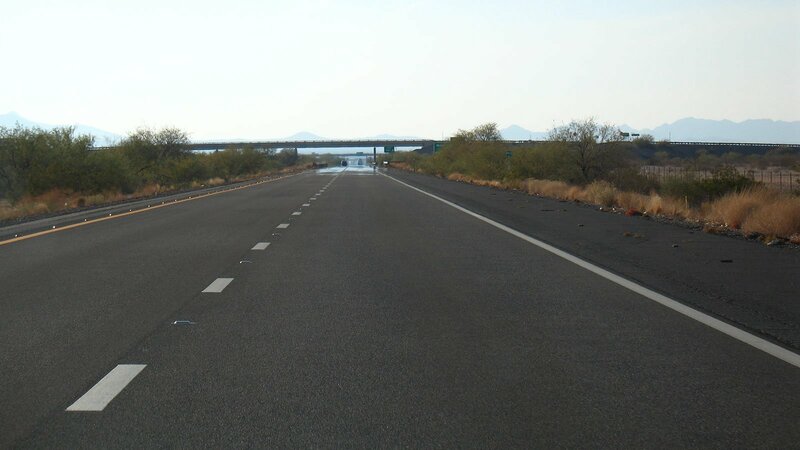 The roads, for example, needed a minimum of two travel lanes in each direction, exactly 12 feet- wide each, with a 10 foot-wide, right paved shoulder, and a 4 foot-wide left paved shoulder. The standard overhead clearance, meanwhile, was designed to accommodate military convoys. This standardization of the materials, specifications, and signage were all designed to make the ride more predictable and thus safer. It didn’t take long for that homogenization to become a cultural norm, extending beyond the on-road experience to retail and dining options along the highway exits. McDonald’s, for example, grew in tandem with the highway system – going from 34 restaurants in 1958, to 102 in 1959, to more than 1,000 by 1970. The new highway system bolstered many other industries, as well, allowing trucks to deliver goods quickly and directly to any destination – something railroads couldn’t do. But while the interstates were good for manufacturers, developers, entrepreneurs, retailers, and commuters, they had a devastating impact on many people living in America’s cities. Eisenhower had initially envisioned loops around cities, which would allow for quicker construction and avoid the cost and complications of land acquisition. And it happened at a time when other “urban renewal” initiatives were gaining momentum and were often used in tandem with highway construction to raze mainly low-income African --American and ethnic neighborhoods. Among them was the Housing Act of 1954, which provided federally backed mortgages that encouraged local developers to acquire land in areas perceived to be “blighted” and to target them for redevelopment. 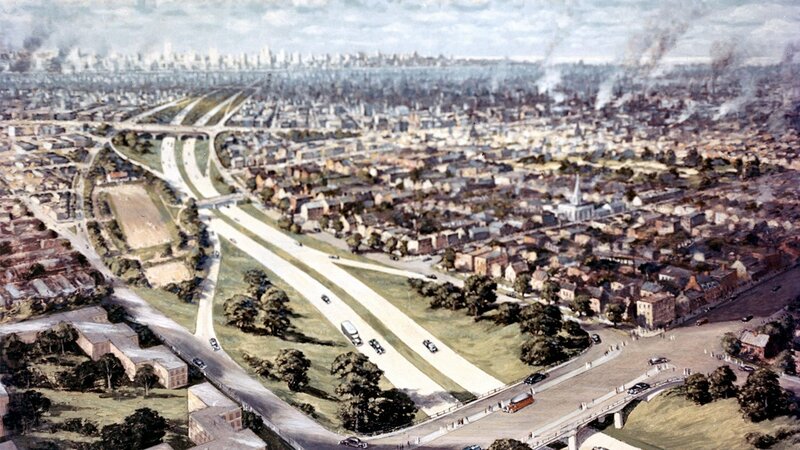 Between 1957 and 1968, at least 330,000 urban housing units were destroyed as a direct result of federal highway projects, according to a report by the National Commission on Urban Problems. By the early ’60s, those projects dislocated an average of 32,400 families each year. Low-income residents often ended up moving into even worse, often overcrowded housing or into housing projects that were often isolated by massive highways or interchanges. “The forced relocation of blacks from central-city areas triggered a massive spatial reorganization of urban residential space,” wrote Mohl. “The expressway building of the 1950s and 1960s, then, ultimately helped produce the much larger, more spatially isolated, and more intensely segregated second ghettos characteristic of the late twentieth century." 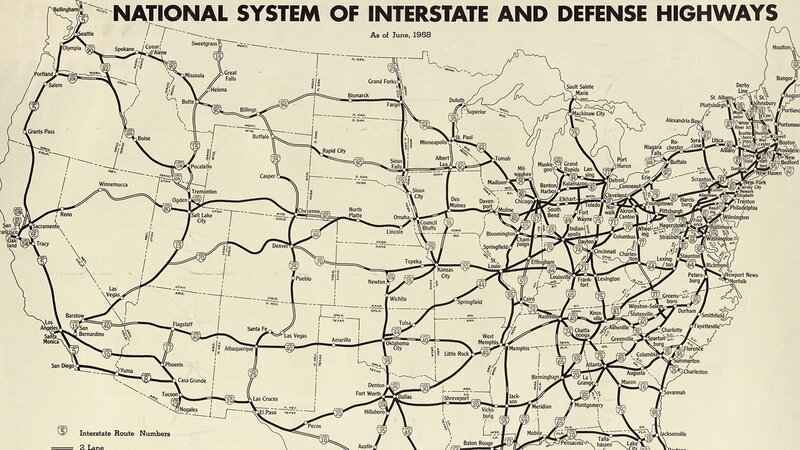 For better or worse, the Interstate Highway System had paved the way for a massive reorganization of America, much as the canals and railroads did in previous centuries. “The interstate system was the gas on the fire that really pushed us into the modern age,” said McNichol.